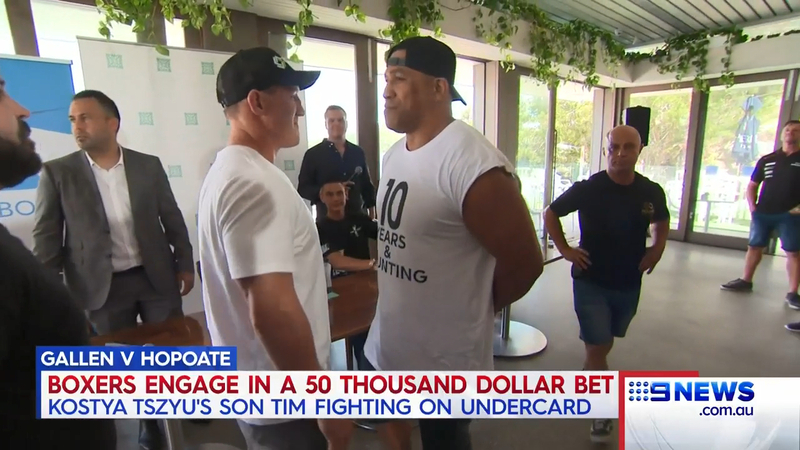 The much anticipated clash between Paul Gallen and John Hopoate is just hours away, and the Sharks veteran has taken a swipe at critics of the fight. Gallen and Hopoate came in for criticism from George Kambosos Jr earlier this week who said he felt embarrassed by Australian boxing being represented by the likes of Gallen. However, the 37-year-old put his critics in their place in a pre-fight chat to Fox Sports. "To be able to attract people to the sport, and watch the sport, in front of thousands [at the venue], and thousands of people watching at home, it’s only beneficial to boxing and I don’t understand why people involved in boxing want to bag it," Gallen said. "I hear boxing people blow up about it and say it’s a joke. I’ve got to say without talking ‘Hoppa’ up, Hoppa’s won the Australian title, you don’t win an Australian title unless you can fight. He’s beaten all the other blokes to it, so for people to say this is a joke, it’s not a joke at all. "We’d beat most guys in Australia. Hoppa was the number one in Australia, and at one stage I think I was rated in the top 15 so there’s a lot of guys we’re in front of there. Hoppa’s jumped in [the ring] for the 17th time, and I’m the ninth time so we can do it." Gallen and Hopoate have both talked big games heading into the fight, and the pre-bout tension culminated in a little bit of a scuffle at yesterday's weigh-in. With the fight just hours away, here's everything you need to know. Paul Gallen and John Hopoate will face off on February 8. The Star of the Boxing Ring event will get underway at 6.30pm AEDT, with the fights set to commence shortly after. Where will the fight be held? Paul Gallen and John Hopoate will be fighting at the Horden Pavilion in Sydney. The Moore Park venue has a capacity of 5,500 and it is the first time that the Star of the Ring charity fight night has taken place there. Last year's event took place at the Star Event Centre with Anthony Mundine the headline act. The Paul Gallen and John Hopoate fight will be live streamed on Main Event for $49.95. The package will include all ten boxing bouts and will be broadcast through Foxtel. Main Event have also scheduled replays of the fight on 1am and 8am on Saturday, February 9. According to SportsBet, Paul Gallen is the hot favourite to take out the blockbuster bout with John Hopoate. The Cronulla Sharks veteran is $1.20 to take out the 45-year-old, with Hopoate paying $4.25 for the win.